The BC3 Advanced is the latest addition to the Oris BC3 collection, which has been redesigned for 2010 after ten successful years. Advanced by name and advanced by design it has some eye catching design features to add to its mechanical prowess. ‘Advanced’ is the aerobatics class for experienced pilots and was influenced by Oris’ partnership with display pilot Don Vito Wyprächtiger. Vito competes to show something outstanding to the judges during his performances, and the BC3 Advanced always stands out in a crowd. 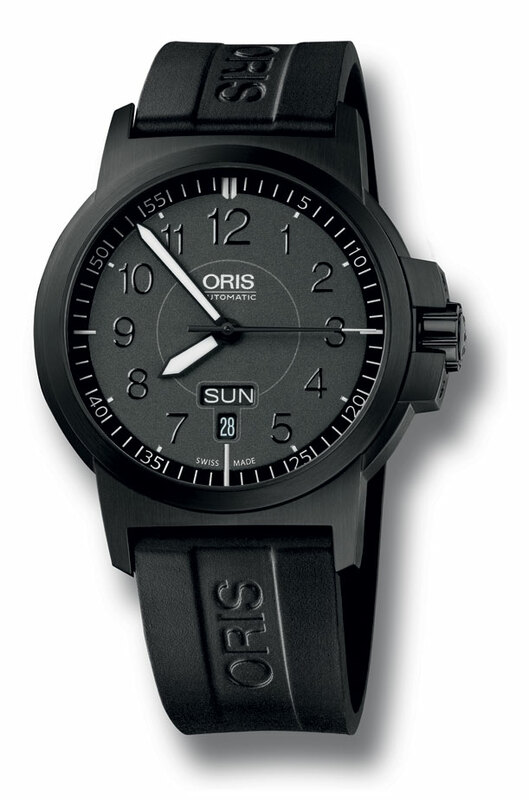 The black DLC coated case is heavy duty, containing the dynamic power of the quality mechanical movement. The watch is protected against accidental adjustment by the crown buffer, which is secured with specially developed screws. Even the dial is coated with black Superluminova for a stand out look. With a choice of rubber or leather strap the BC3 Advanced is cool, sporty and lets its look do the talking. Outstanding. · Automatic mechanical movement. Centralised second, minute and hour displays. Day and date display at 6 o’clock. · Multi-piece black DLC coated stainless steel case. Screw down crown with red inlay. See through case back. Water resistant to 10 bar/100m. · Flat sapphire glass with inner anti-reflective coating. · Black Superluminova coated dial. · Black nickel hour and minute hands with Superluminova BG W9 inlay. Black second hand with a white pointer. · Available with black rubber strap or black gaucho leather strap, both with black DLC coated stainless steel buckle.